There is a lot of talk lately about UTR and depending on who you ask, you may get different answers and certainly many opinions. 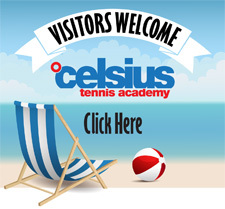 Right now those most interested in the new UTR rating system are higher level junior players like those at Celsius Tennis Academy and other elite tennis programs. If you play competitive level tennis (junior or adult) or are destined to play college level tennis you should have a good understanding of UTR as it is quickly being adopted as the main rating system for college tennis coaches. Let’s take a quick look at the new UTR and the quest for a global ranking system that transcends borders and is perhaps more equitable among players. Universal Tennis Rating (UTR) is a global tennis player rating system intended to produce an objective, consistent, and accurate index of players’ skill in the game of tennis. UTR rates all players on a single 16-point scale, without regard to age, gender, nationality, or locale of a given match. All professional players in the Association of Tennis Professionals (ATP) and the Women’s Tennis Association (WTA) have UTRs, as do most college players and many junior tournament players worldwide, as well as many adult league and tournament players. The UTR database includes results from more than 8 million matches and 200+ countries. More than 800,000 players have UTRs. UTR’s algorithm calculates ratings from the last 30 eligible matches played within the preceding 12 months. The main data points are the percentage of games won (not simply the won/lost result), and the opponent’s rating. Each match played generates a rating; a player’s UTR is a weighted average of all eligible matches. Although tennis is a global sport, it does not have a common international rating system. In tennis, the vast majority of competitive players enter events only in their geographical locale. Whatever ranking they earn has meaning only within that region or country. Rankings sort players into a “pecking order,” assigning each athlete a spot relative to all others ranked in that system. Rankings are ordinal numbers that reflect only the athletes’ relative positions, not their playing skill as measured by a standard yardstick. UTR, in contrast, rates each athlete on a single, standard metric. Therefore, tennis players’ UTRs are largely independent of each other, aside from the algorithm’s weighting of the strength of opponents who compete directly with the rated player. Nearly all tennis ranking systems use a “points per round” (PPR) method that assigns points depending on what round a player reaches in a given tournament, along with the rated “strength” of that tournament in terms of the players it accepts into the draw. This is administratively easy, but it does not consider the skill level of the individual opponents a player faced in the event. Paradoxically, the PPR method can create an incentive to seek out weaker tournaments, in which it will be easier to survive into later rounds. In 2016, the Intercollegiate Tennis Association (ITA) made UTR its official rating system for college tennis in the United States. UTR also extended into the professional game, where all ATP and WTA players now have UTRs. National federations have recognized the value of UTR for attracting players to tennis and for developing their skill through competitive matches. Currently more than 40 national tennis federations have committed to submitting tournament results to UTR. These include the Lawn Tennis Association of Great Britain, Tennis Canada, Tennis Australia, the Brazilian Tennis Confederation, and the Bulgarian Tennis Federation. Recreational tennis—friends hitting with each other or playing games—accounts for the majority of tennis. But at the competitive level, junior play in the United States and elsewhere sorts players into age groups. Typically, this means separate tournaments for players aged 12-and-under, 14-and-under, 16-and-under, and 18-and-under. Tournaments also separate boys and girls into separate draws. Adult events normally sort entrants by half-decades, using minimum instead of maximum ages (35-and-over, 40-and-over, etc.) Separating players into groups by age and gender does organize draws simply, but it also throws together competitors in ways that are unrelated to their tennis skill. Entry to, and seedings in, tournaments typically derive from players’ rankings. These in turn depend on Points Per Round (PPR) amassed in previous tournaments, regardless of opponents’ strengths or actual match scores. The resulting draws often pit top players against much lower-ranked athletes, especially in early rounds, frequently leading to one-sided matches. In contrast and this is what we like, designing draws or flights with UTR consistently produces many more matches between players of roughly equal ability. Two players whose UTRs fall within 1.0 of each other will have a competitive match two to three times as often as those with ratings more than 1.0 apart. Furthermore, research has shown that when players’ UTRs differ by more than 1.0 point, the lower-rated athlete will upset his or her higher-rated opponent only 3 percent of the time. Close, competitive contests are widely recognized by coaches as the most powerful engine for developing tennis skill. Even matches benefit both players. Non-competitive, one-sided matches, in contrast, typically discourage the loser and fail to challenge the winner, offering neither one much opportunity to improve his or her skills. Universal Tennis Ratings are expressed as a number with up to two decimal points falling between 1.0 and 16.50, e.g., 9.46. UTR’s 16-point scale embraces everyone from beginners through intermediate recreational and competitive players, to active tournament and college varsity athletes, and ranging up to the highest levels of the game at the top professional ranks. For example, as of January 2018, Rafael Nadal of Spain held a UTR of 16.27 and Switzerland’s Roger Federer was at 16.21. Simona Halep of Romania was rated at 13.26 and Serena Williams of the United States at 13.20. Turning to college players, NCAA Division I men generally fall between 12.0 and 15.0. NCAA Division I women typically hold UTRs between 9.0 and 12.0. The vast majority of UTRs derive from sanctioned tournament results. Universal Tennis regularly records results from all ATP, WTA, and ITF Junior and Futures events; all sanctioned USTA junior events, and all ITA (Intercollegiate Tennis Association) and NCAA dual matches and tournaments. UTR also incorporates results from a growing number of national federations. It updates and maintains ratings for more than 800,000 current competitors, and its database includes 8 million match results. To ensure verification, UTR only accepts match results that have been published on the internet. How do you sign up for a UTR? A player profile is a UTR webpage where a players rating, match history, and preferences are stored. Every player at MyUTR.com must claim or create a player profile. You’ll create a player profile during sign-up if you’re new to tennis or don’t have any scores recorded in our system. You’ll claim a player profile if you already have some play history online. Your player profile may already exist, but you’ll need to claim it in order to make changes and customize. So how do you claim your profile? 5. This next part is really important! You could already have a player profile at MyUTR.com – now you need to claim it. Click “Yes, this is me” on the information that matches you and claim your profile. There are many more nuances to the new UTR rating system and we will provide our assessments and updates as they become available. Like all systems, they evolve with time and technology.